Martin Luther King Day. Jorge Garcia has lived in this country since the age of 10. He is now 39. If he were just two years younger he might have qualified for DACA. This day was the day chosen for his deportation. Jorge Garcia was a model non-citizen. A family man with a wife and two young children, he regularly paid his taxes and committed no offenses, not even a traffic violation. The kind of human being that America needs. That his family needs. Nevertheless, ICE refused to wait for a new DACA law that might expand the qualifying age range. 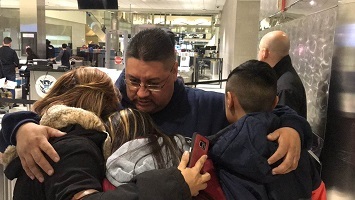 Two ICE agents watched as his family, unable to stop crying, hugged him for possibly the last time. Then they put him on a plane to Mexico, a country he hasn’t seen in 30 years. Not since he was younger than his children are now. Last year, right after taking office, Trump signed an Executive Order greatly boosting the power of ICE and vastly increasing the number of deportations. Many people like Jorge Garcia were caught in the sweep. The effect on the family is devastating: not only are people separated from each other, the deportee is thrown into chaos and the family members left behind lose their breadwinner and have to find some way to cope. A needless destruction of what was a functional family unit making a positive contribution to society. So what happened to the Party of “Family Values”? Where are the “Values Voters” when we need them? Oh yes - those “Values Voters” put into power the regime that is destroying families in order to Make America Great Again. Perhaps if Jorge Garcia had come from Norway he might have been saved. Please watch the video at the source link below. Niraj Warikoo, “After 30 years in U.S., Metro Detroit Immigrant Deported to Mexico,” Detroit Free Press, January 15, 2018.